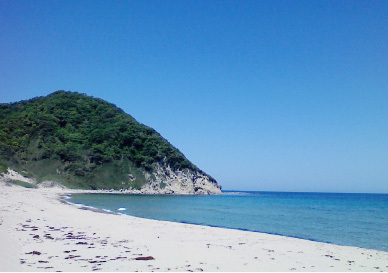 Kyotango, located at the tip of the Tango Peninsula in far northern Kyoto Prefecture, is a region blessed with the natural beauty of sea, mountains, and rivers, and is nicknamed “Kyoto by the Sea.” The coastal scenery is particularly spectacular, testifying to the geological history of the Sea of Japan’s formation some 20 million years ago, and was designated in October 2010 as San’in Kaigan Geopark, part of the UNESCO-backed Global Geoparks Network. go snowshoe trekking with a picnic lunch! the port, then feast on fresh-made sushi! in Kyotango to the fullest. 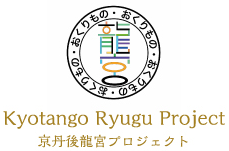 Totoya is your home base for experiential programs unique to Kyotango and built on its natural wonders and traditional lifestyles. Right here at the inn, we’ve got the best hot spring baths and the finest dining around. 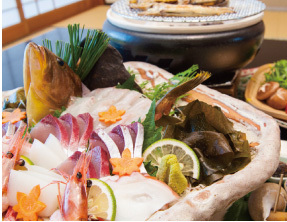 Soak in the soothing hot waters of Taiza Onsen, and savor the freshest local seafood. Taiza crab is known as the finest around, and Totoya’s proprietor herself heads out to auctions to select the absolute cream of the crop. Totoya is the hometown inn where you can truly "savor" the finest of everything Kyotango has to offer. A 180-year-old farmhouse nestled deep, deep in the mountains of Kyotango. 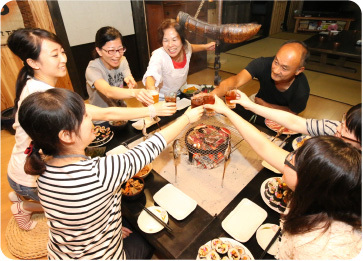 Just one group per day – one family or one group of friends, for example – can stay for an immersive experience in the leisurely country life. The famously charismatic female proprietor and her kind-hearted husband welcome you to the place where you can fully experience the natural environment and culinary delights of Kyotango. 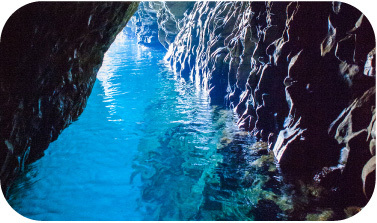 Natural hot springs, a warm atmosphere, and unforgettable local cuisine make this the place to luxuriate in hot-spring heaven. 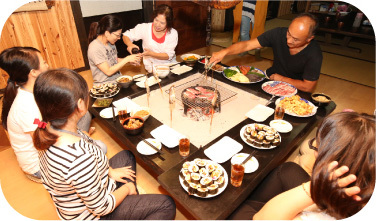 At this cozy inn you’ll feel like part of the Maruta family, while enjoying swimming in the sea in the summer, crab cuisine in the winter, and a range of hands-on programs such as hand-making sushi with locally caught fish. Also enjoy nature through Nordic walking with the inn’s energetic female proprietor. 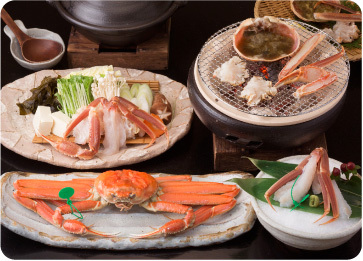 The Matsuba crabs caught near Taiza Port in Kyotango are called “Taiza crab” and are in a quality and flavor class all their own. The catch begins on November 6, and they are available through March. 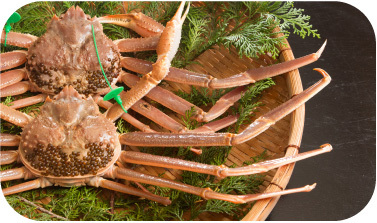 Female Seko crabs can be enjoyed through the end of December as well. 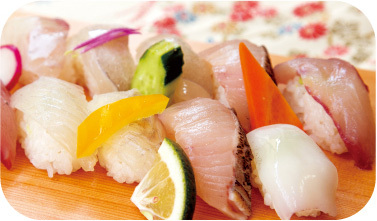 Fresh seafood caught off Kyotango has resilient flesh, firmed up from being tossed by the rough waves of the Sea of Japan, and is extraordinarily delicious. At some inns, fresh fish from the early-morning catch is served straight away for breakfast. 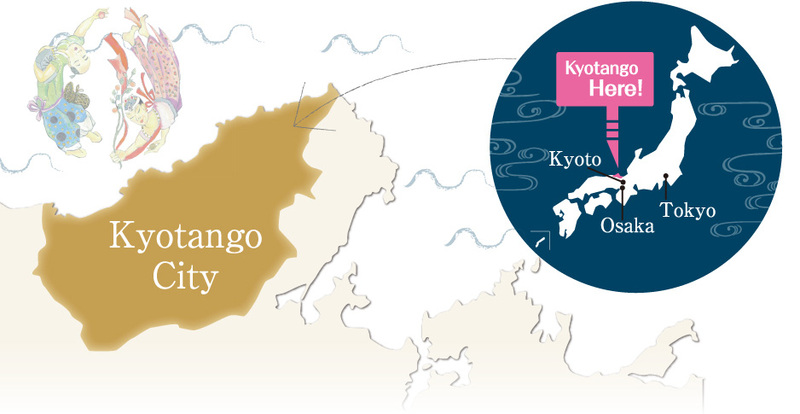 Blessed with fertile soil and pure water, Kyotango is home to numerous farms. At some of these you can experience harvesting seasonal crops. 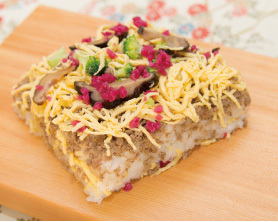 In addition, you can try your hand at using the freshly harvested foods to make traditional Kyotango bara-zushi (sushi rice with colorful ingredients scattered festively on top of it) and miso. Kyotango is a treasure trove of fruit, including strawberries, peaches, Asian pears, melons, watermelons, grapes and more. 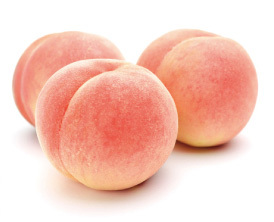 Some orchards let you pick fruit and then eat it on the spot! “Kyoto by the Sea”: the phrase refers to the northernmost part of Kyoto Prefecture, known as the setting of numerous myths and legends. 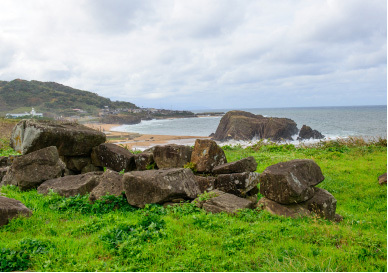 The region has many sites that call out to be photographed, and wear different faces depending on the season and time of day, including the spectacular coastal scenery and ruins that harken back to the dawn of Japanese culture and civilization. 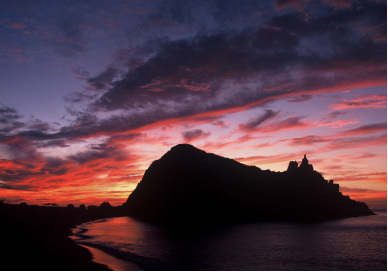 This basalt crag, a rare sight in Japan, is a whole kilometer in circumference, and is one of the most photographed spots in San’in-Kaigan Geopark. 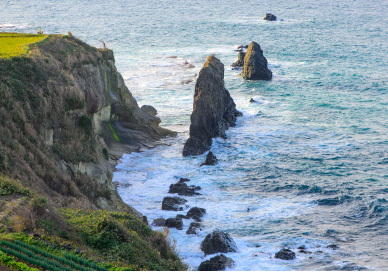 The name means “Folding Screen Cliffs.” The 13-meter-high andesite cliffs jutting up vertically from the sea resemble a Japanese folding screen. This group of tumuli (burial mounds) from the late 6th and early 7th centuries overlooks the sea and has a breathtaking view. may differ depending on transit conditions, which train you board, etc. All programs require advance reservations. There is a charge for all programs.